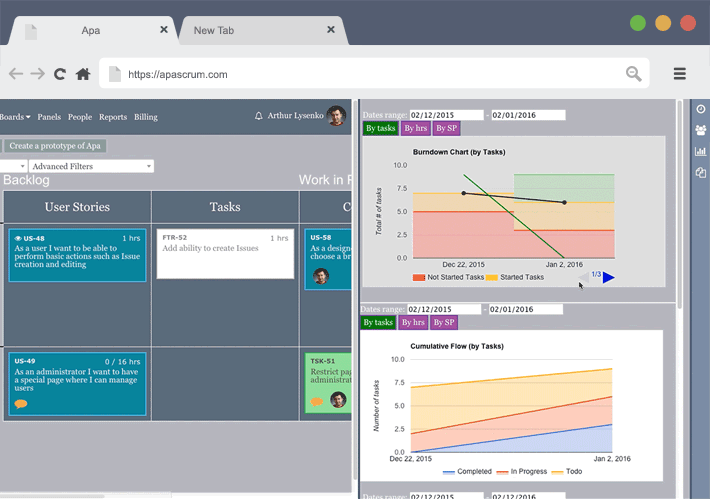 Agile & Lean software doesn't have to be complicated. We were all frustrated by the complexity of existing Scrum / Kanban software. It's just too much of an effort clicking on 10 buttons and navigate through 5 pages to perform simple actions like moving a task onto a board or creating a Sprint. That's why Apa was created. Now you can stop fighting with your old Agile tools and start focusing on what really is important - delivering great products and experiences. 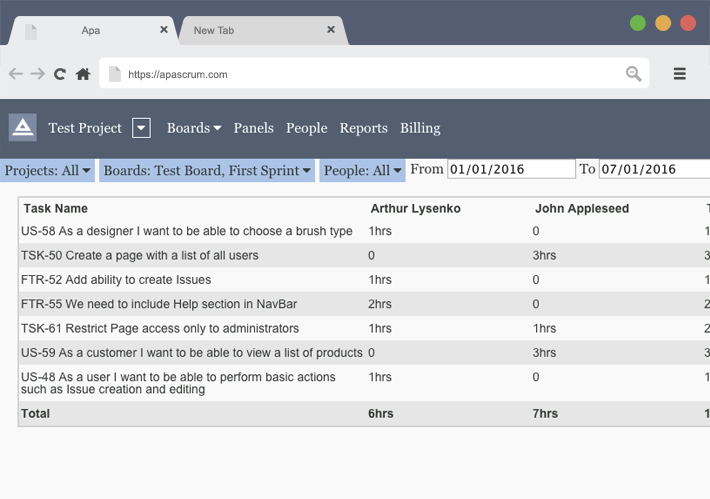 At least 50% of team’s time will be spent on boards. That's why working on them should be as comfortable as possible. Anything you do on Apa's boards - moving a task, adding assignees or leaving a comment - is done simply and effortlessly. We understand that your workflow is unique. That's why we created a user friendly and powerful visual board manager. You can change any board to fit your needs by simply dragging and dropping stuff around. 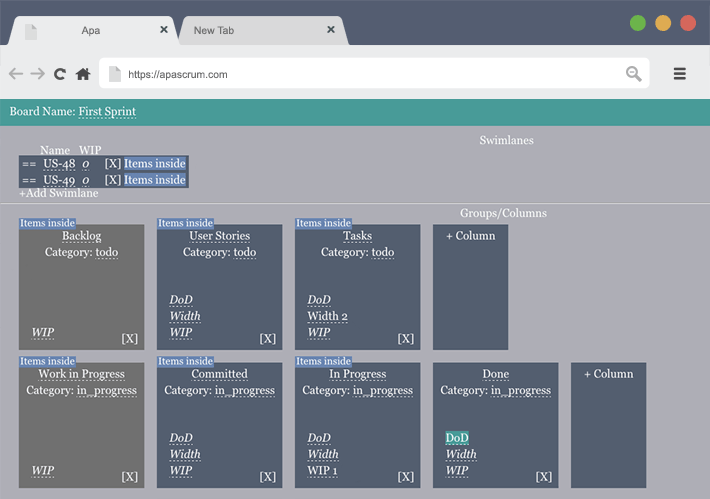 Creating columns, changing their widths or rearranging them is done with very little effort. 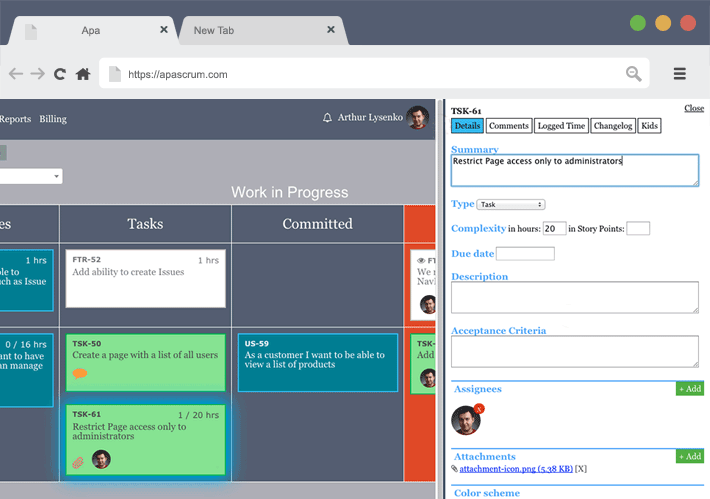 All your actions on Apa’s boards are automatically synced across all your team members. That's why our virtual boards are like physical ones but with the software advantages of accessing powerful data filters, ability to attach files, comments, view changelog and so on. 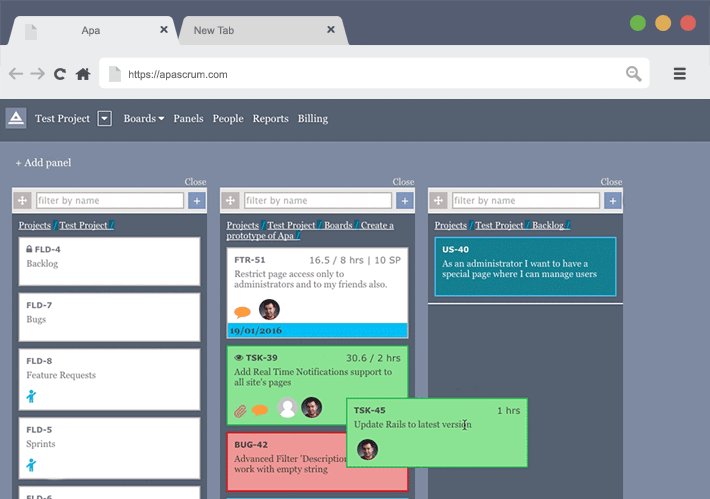 Create User Stories and Issues in Visual Panels to access them on Boards later. Easily re-organise them by priority, move them between folders and edit them using our intuitive drag'n'drop functionality. Burndown Chart, Cumulative Flow Diagram, Lead Time / Cycle Time diagrams - we have them all and they are all accessible without leaving a board. Our Enhanced Burndown Chart is a very powerful analysis tool - in addition to regular data it also shows task states (Todo / In Progress / Done). These are shown because, after all, it doesn’t matter if your team has burnt 90/100 estimated hours if none of the tasks have been completed. That’s why task states must also be displayed. And in Apa they are. 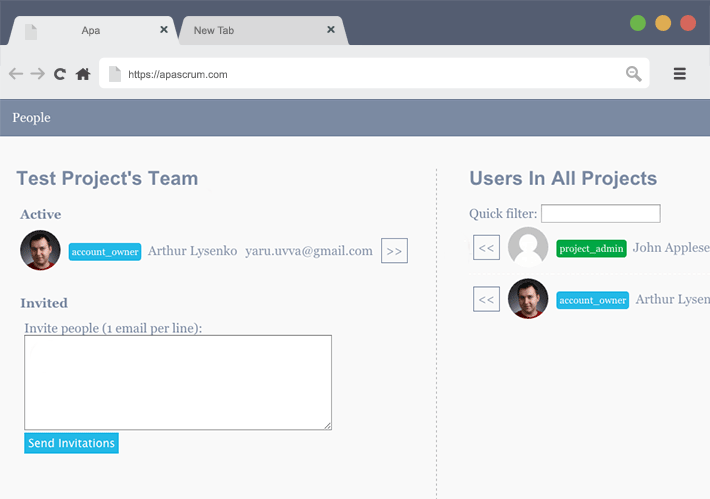 Know how productive your teams are. Predict their speed and capacity by looking at Velocity historical and projected data. 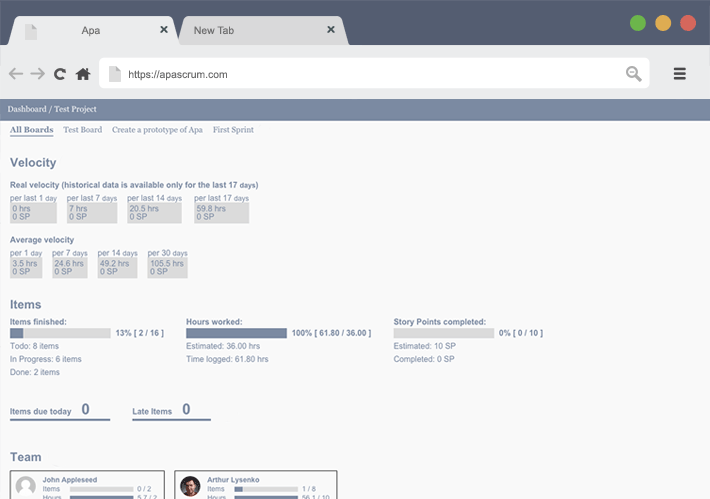 Dive into stats about each board or team member. See if projects are on track instantly. Control who has access to what in Apa and how many privileges they have. Whether you assign a person to a project or change someone’s permissions - you always have the precise control over it. Sometimes you need to know how many hours a particular team or person spend working on a Project, on a Board or even on a particular task. You can easily get this detailed information in Apa’s timesheet reports. 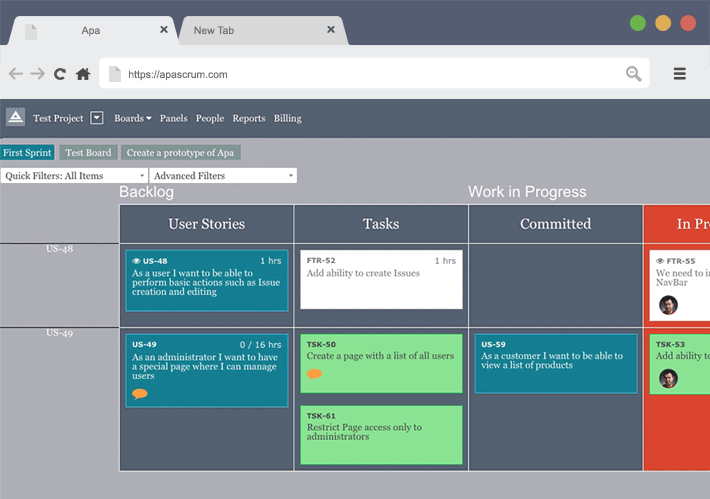 Any Scrum board can be easily modified to a Kanban or Scrumban board and vice versa. It does not matter if your team has burnt 90/100 estimated hours if none of the tasks has been completed after all. That’s why the task states(Todo / In Progress / Done) should be displayed as well. Max attachment file size 2GB 2GB ? 50Mb 4Mb ? Currently Apa is free for all users, enjoy!